SOUTH BEND, Ind. (AP) — David Pastrnak delivered once again. 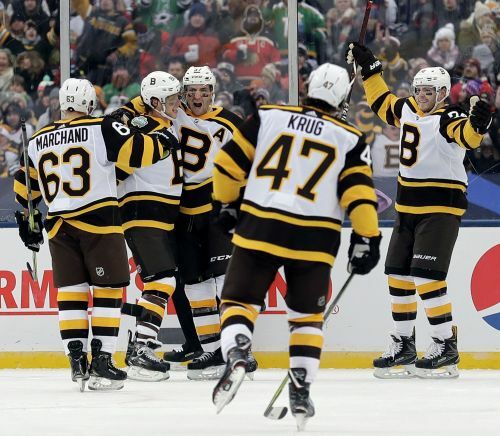 Patrice Bergeron showed off his all-around game, and Tuukka Rask made a couple of big stops. NOTES: It was Perlini's third goal in his past eight games. He had two goals in 22 games with Arizona before he was traded to Chicago on Nov. 25. ... Blackhawks F Patrick Kane lost his seven-game point streak. ... Bruins F David Backes served the second of a three-game suspension for an illegal hit to the head. ... Marchand returned to the lineup after he missed Saturday's 3-2 overtime win at Buffalo with an upper-body injury.